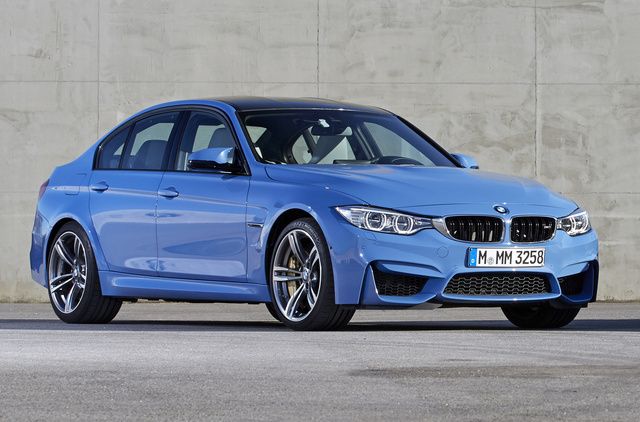 Have you driven a 2015 BMW M3? Displaying all 7 2015 BMW M3 reviews. Back Seats Ranked 2015 Porsche 911 GT3 worse. "GT3 does not have back seats"
Value Ranked 2015 Porsche 911 GT3 worse. CarGurus has 1,404 nationwide M3 listings starting at $6,950. I have owned the others ranked, including an AMG E63. This M3 takes the driving experience to a whole new level. It is, in my opinion, more of a sports car than most two door sports cars on the road. It would walk all over the S5 all day. Heck, I have an RS5 and this M3 would stomp a hole in the ground on me. No match. E63 has similar very violent acceleration. That is about the only similarity. Looks/Style Ranked 2015 Ford Mustang GT Premium Convertible better. Would Buy Ranked 2015 Ford Mustang GT Premium Convertible better. After owning a couple 911s, I wanted something with a usable back seat, more power and good handling. The M3 does it all. It handles 95% of a Porsche, has more power, and sells for $10k less than a Cayman (and about $40k less than a same year 911S). Plus, I bought mine in white, which will blend in a little more with other traffic. Power Ranked 2014 Porsche Cayman S worse. "The Cayman S has a lot of power, 340 hp or so. The BMW turns out a whopping 425 hp and 400 fl-lbs of torque. It also weighs about 400 pounds more, but doesnt feel like it." Handling Ranked 2014 Porsche Cayman S better. "The Cayman S is so balanced and smooth. Mid engine makes it feel like its pivoting around the center of the car. The BMW steering is heavier and doesnt have the feedback of the Porsche, and though it handles great, it still isnt a Porsche." Looks/Style Ranked 2014 Porsche Cayman S worse. "Both cars look great. One is a sedan, and in a neutral color, its a stealth power car. The other is a 2 door sports car with no apologies for what it is!" Front Seats Ranked 2014 Porsche Cayman S worse. "Both are great, very supportive. Both cars are low, making ingress and egress a little difficult, but hey, theyre both sports cars! The best seats in the world are still the Porsche 18 way sport seats, nothing comes close." Back Seats Ranked 2014 Porsche Cayman S worse. "LOL, what back seats? Only the M3 has them." Family Car Ranked 2014 Porsche Cayman S worse. "Four doors vs two. Rear seat vs none." Front Seats Ranked 2015 Ford Mustang GT Premium better. "The M3 factory seats didnt feel as high quality as the GTs, which surprised me. The GT I ended up buying had the Recaros, but thats a different story." Value Ranked 2015 Ford Mustang GT Premium better. "Umm... cost to power/performance/quality? Even the fully loaded GT I bought was 43k vs an M3 similarly equipped would cost 78k"